This is the Story of a Stone which had defied detailed reading for decades. It was a plain sandstone panel (or so it seemed) inserted in the chancel north wall, beside the ornate Urquhart of Braelangwell “doorway” memorial. You could just make out enough to say it mentioned David Urquhart of Braelangwell, and the date 1752, but no more. 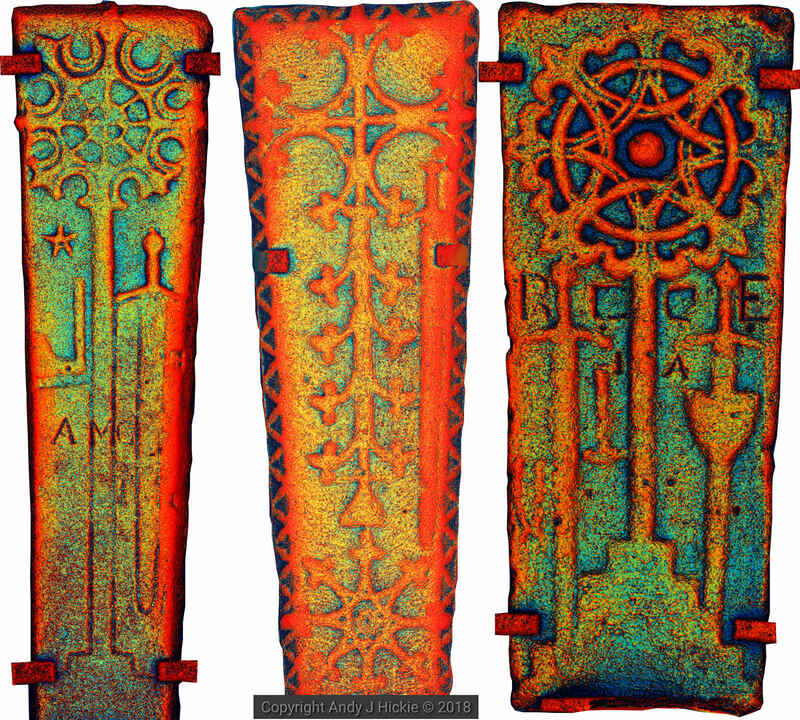 Andy Hickie’s fantastic photogrammetric images of Kirkmichael ornate medieval crosses can be seen in their own Story, and were featured in our summer 2018 exhibition at Cromarty Courthouse. Three wonderful medieval crosses in false colour photogrammetry in the nave display at Kirkmichael. And his work in helping us to decipher the Urquhart of Ferryton inscription on the arched tomb recess outside the nave door is the subject of yet another Story. But now we can reveal his work in reading this Urquhart panel in the chancel which had stumped us. The plain panel contrasts with the adjacent ornate Urquhart of Braelangwell memorial. Photo by Andrew Dowsett. The stone itself is most unusual. To the visitor it simply looks like a thin, flat panel. However, when we had it removed from the wall for conservation in 2017 we found that it bulged out irregularly right into the wall! During the restoration I was determined to get a damp proof membrane inserted behind all our sandstone memorials, but the unusual shape of this panel thwarted us at first. 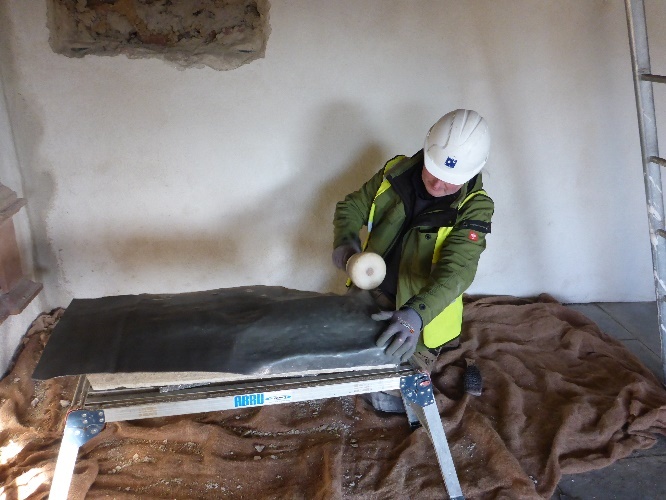 Laing Traditional Masonry conservator Derek Cunningham solved the problem by fitting a lead damp proof course around it. 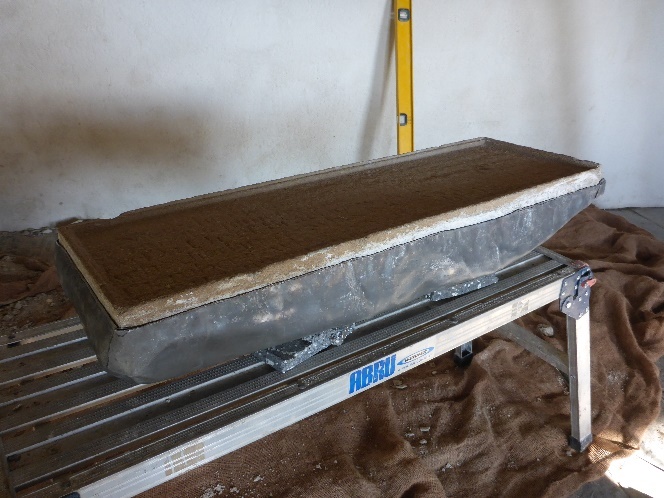 Why is a damp proof membrane a good thing? 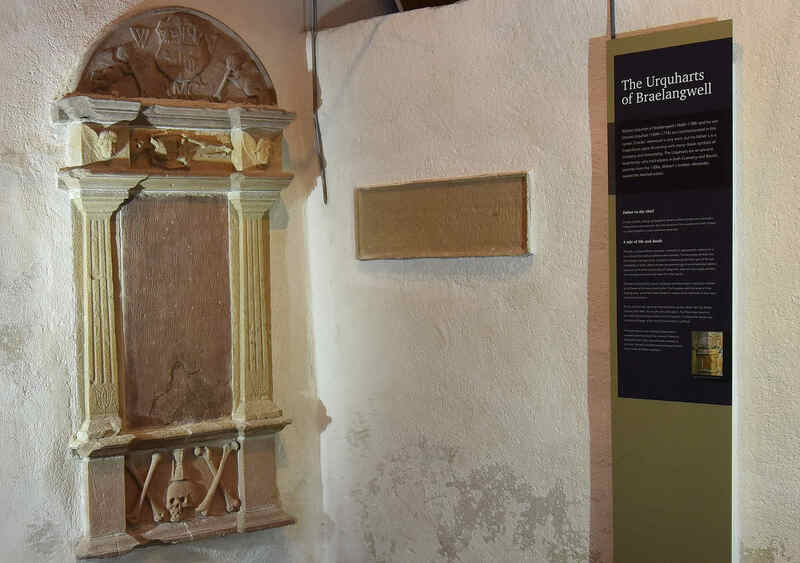 Well, there is no damp proof course in the walls – they are medieval after all – so the moisture from the soil is drawn up through the wall to issue through the sandstone memorials, damaging them – unless a damp proof membrane is put around the memorials themselves! You can see this effect in other heritage buildings in the area with sandstone memorials sunk into an unprotected wall continuing to deteriorate. I do wonder if part of the reason for the serious erosion of this particular memorial was due to its relatively large volume of sandstone soaking up much of the damp coming up the wall at this point. Anyway, the stone is now fully lead-lined. Derek Cunningham shaping the lead around the bulge on the panel. Photo by Derek Cunningham. Fully lead-clad and ready for re-installation. Photo by Derek Cunningham. Even with the Kirkmichael Lampie, the panel yielded only enough words to confirm the name of David Urquhart of Braelangwell and the date of 1752. Enter Andy Hickie! With his photogrammetry we now know it is an affectionate memorial by David Urquhart of Braelangwell to his grandmother, Anna McCulloch of Plaids, who died in 1752 and “whose holy example in life he still remembers”. Parts of the final line of the epitaph still elude us, so there is further work to be done! Anna’s husband, William Urquhart of Braelangwell, is recorded on the superb, ornate stone adjacent to this simple panel – how unfair is that. He died in 1708 aged 48, while clearly Anna survived to a ripe old age. This is the best image we could get with angled lighting from the Kirkmichael Lampie, which in itself was a great step forward, and you can just pick out a word or two. Tantalising. Photo by Jim Mackay. While a few words and figures still elude us, the whole nature of the panel has changed. What was previously thought to be a memorial to a David Urquhart of Braelangwell who had died in 1752 is now known to be a memorial by David to his grandmother Anna McCulloch of Plaids, the wife of William Urquhart of Braelangwell. Her date of death had been previously unknown. Charles was the son who inherited; and David, his son, commissioned his grandmother’s memorial. Some documents suggest he died in 1752, but we can see how that came about. From this very memorial the year 1752 and the name Da Urqt can just be made out, and earlier historians made a leap of faith that the memorial commemorated him, whereas in reality it commemorated Anna McCulloch. Anna’s son Charles died in 1776 [Scots Magazine: 1776 … July … 27. At his house in Rossshire, Charles Urquhart of Braelangwell, Esq;]. Charles is said to have been born in 1699, although I have yet to see the primary evidence for this. Indeed, some websites seem to have grafted a whole crop of siblings onto Charles, but without foundation, I suspect. I don’t accept anything I see on the web unless I see the source. The McCullochs of Plaids were an influential Easter Ross family, several of whom were Baillies of Tain. They held Plaids for at least three centuries.It is not known how William Urquhart met Anna McCulloch but of course with Tain being a town of importance in Ross-shire at the time, then perhaps they met when William was in Tain on business. With Anna’s husband dying a relatively young man in 1708, aged 48, she must have been the dominant force in Braelangwell for many years. 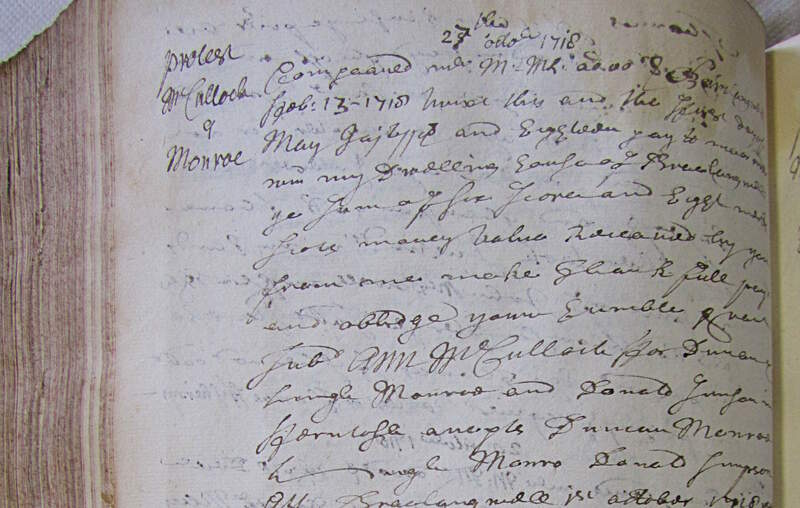 We have begun to research Anna McCulloch, and here she is recovering a debt from some rascally Munros in Ferintosh in 1718, three hundred years ago! Somehow figures of the past become more real when you can see evidence of them engaged in practical activity, like chasing up debts! Photo by Jim Mackay. 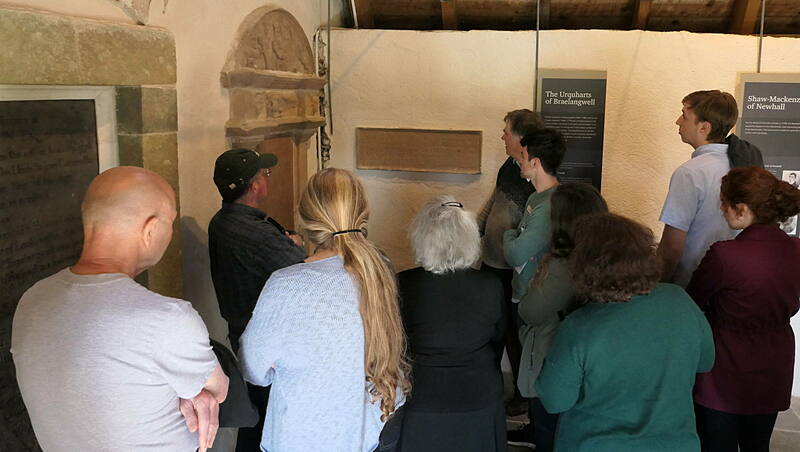 In July 2018, I was able to show the now largely deciphered panel to a group of Clan Urquhart members, including the redoubtable Dowager Urquhart of Urquhart, when they were over from America. The chieftainship descends from Urquhart of Braelangwell so both this panel and the elaborate memorial beside it are of particular interest to the clan!